Photographic installation with sound. 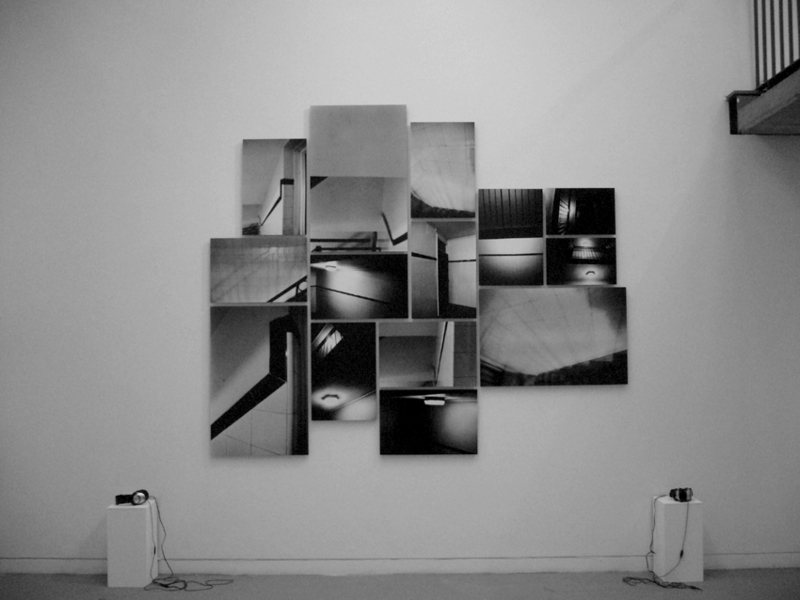 It comprises of 14 black & white photographs of different sizes, mounted on mdf (290 x 270 cm). Disorientation, estrangement, alienation, our relationship with the physical and mental space, hiding behind walls, memories of a space, are part of my photographic process. I live in a council apartment block. The communal spaces are very impersonal. The fact that I rarely see any of my neighbors but I can hear them has intrigued my imagination since the first day I moved in. I have been up and down all the different staircases capturing with my camera images and the different ambiences of the building. “The corridors are cold because some of the windows are open. The smell of bleach is mixed with the smell of cooking and dampness. Someone’s clothes are drying on the staircase’s rails. I can hear a door opening and someone going up the stairs. My heart is beating very fast and my knees feel very weak. It’s three o’clock in the morning and I am taking photographs of the building. The lights, the tiles on the walls, the steps, a closed door are my usual subjects”. While I was photographing, I thought that the sounds I was hearing were very interesting and decided to record them. After six months of photographing and recording in there, the physical space was not important anymore. Exploring the enclosed space opened up views to the impossible space. The haunting silence and the cold emptiness of the staircase turned into a game of perspective. And the sound of laughter became a passage to reality. The identity of the building is not essential. It could be somewhere when that somewhere is nowhere in particular. My photographs isolate fragments of the space. Ideally, when looking at a selection of my images together with the sound, the viewer experiences a spatial disorientation. Putting together images that are close ups and images of more general views, creates an abrupt change of scale which results to perceptual confusion.